It is here, the last Sunday Long Run before Boston. A nice familiar route to work those legs a little. That’s all you should be doing this week, keeping your legs moving with a few runs at a comfortable cruising pace. I’m sure more than half of you have some aches and pains that have your brain buzzing with “what ifs”. From my experience (and for some that don’t know, yes I used to run marathons) these little nagging injuries mentally become more of a threat to your race at this time than they did the last 3 months and tend to feel a lot more dooming. Take care of the muscles and joints that are complaining, but don’t let them get you down. Most of the time they disappear before the day of the marathon as quickly as they mysteriously appeared. I won’t ensure you that something won’t pop up during the run, but most of the time the thing you fretted about during your taper is not the thing that bothers you during the marathon. Try to stay positive! Everyone has been running amazingly. I’m so impressed with this group. I expect good marathon days for all. 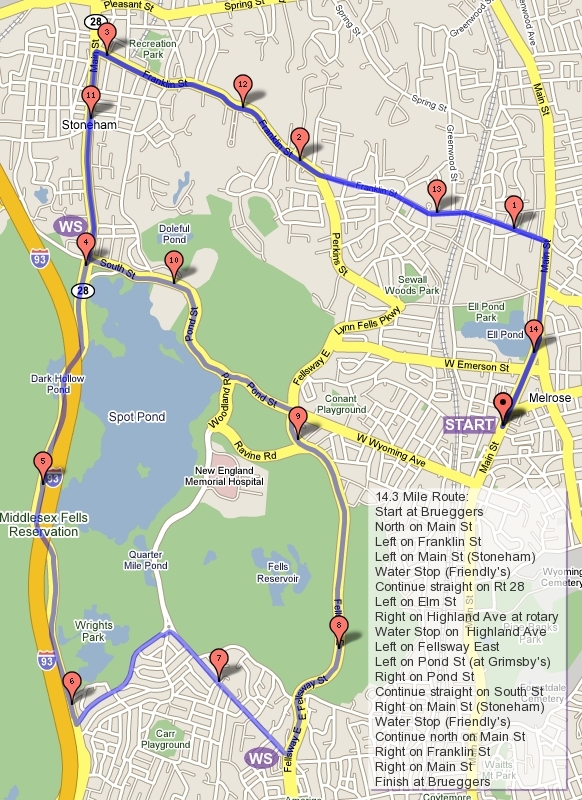 Ok, this week’s route… We’ll start out along Main Street up past Ell Pond. As you pass the monument to Clarence DeMar and the marathoning history of Melrose realize you’ve trained along the same roads as some of the most successful marathoners in the long history of the Boston Marathon so you must be ready! Turn left on Melrose Street and a quick left onto the Lynn Fells Parkway. Ride easily through the hills past Grimsbys and along the Fellsway East. When you reach the Highland Ave traffic circle turn right onto Highland and make your way towards Spot Pond looking for the water stop on your right before the rotary at the other end of Highland Ave.
After that water stop, the route has you all continuing along the front side of Spot Pond. shorter route runners will turn right on Pond Street and continue on West Wyoming Avenue to Main where you’ll turn left and finish up your run. Longer runners will continue around the pond, past the Stone Zoo, veering left through the Straw Point parking lot, left onto Main Street/Fellsway West as that takes you around the back side of the pond, over and under I93 to a left on Elm Street. Elm will climb back to the rotary where a right on Highland will bring you back to the water stop. After that stop continue on Highland, turn left onto East Border Road and run up to the set of lights at an intersection with the Fellsway East. Left on the Fellsway will bring you over to Grimsby’s. Turn right there, follow West Wyoming to Main Street, turn left and run to Brueggers to finish your Winter of 2016 Sunday Long Run training season! Water stops… there’s one and I’ll take care of it. If anyone wants to hang out with me, feel free. For those training for later marathons, after this week people tend to continue to run on Sundays, meeting at Brueggers, but water stops are less formal if they exist at all. Watch the MRC forum or Facebook for discussions about routes. Also I want to make sure to thank all who helped this season: Lois Parker Carmona, Alicia Furbush and Courtney Koschei, Don Keren, Denise Judware, and each of those that pitched in for a water stop or two to make the runs easier and keep the runners happy along the way to meeting their goals. Ok, who’s in for the last SLR of the season? ROLL CALL! Hmm, its gonna snow? And be very windy? Welcome to Taper Time in April in New England. After a fun trip to Hopkinton, and a run to Boston, now its taper time for many of the runners. If you’re not running Boston and you want to get a bit more miles in tomorrow, let me know and we’ll see what we can do for water stops to support. The run this week, will start from Brueggers at 8AM and run a similar route to what was run a few weeks ago. We’ll cross Main Street and run out East Foster up to Melrose Common. Turn right onto Sixth Street and continue straight on to Swain’s Pond Ave. Run through the wooded Swain’s Pond neighborhood, turning right at the stop sign at the ponds to stay on Swain’s Pond Ave. At the end of Swain’s Pond Ave (have I said Swain’s Pond enough?) turn right onto Lebanon Street. Run to a set of lights where you’ll turn left onto Forest Street. Run along this street as it winds past Oak Grove Cemetery and comes out at Main Street in Malden. Cross Main and find the first water stop in the parking lot of Citizen’s Bank. After the stop run out the opposite side of the parking lot onto Winter Street. This road will pass Oak Grove Cemetery where you’ll come to a big intersection. You want to cross straight across Washington Street up onto Glenwood Street. This street will wind you over to Highland Ave where you’ll take a slight right to the traffic circle at the Fellsway East. Turn right and run through the hills of the Fells over to Grimsby’s. If you’re running short, turn right here onto Wyoming and then turn left on Main to finish up 7 miles. If you’re running longer you’ll continue on the LynnFells Parkway. Keep going to Melrose High School where you’ll find another water stop at the knoll on your right. As you leave water stop 2 you’ll continue on the LynnFells Parkway past the lights at Main Street, past the lights at Green Street, and after another mile or so to a set of lights at Main Street in Saugus. Turn left here and continue along as it turns to Farm Street in Wakefield. Turn left onto Nahant Street across from Wakefield High School. Nahant will pop you out to Main Street in Wakefield where water stop 3 will be waiting at the Nick’s Pizza parking lot. From Nick’s you’ll run straight along Main Street back to Melrose, back to Brueggers with another 14.8 training miles behind you. I’ll plan on supporting a water stop near Brueggers for those looking for more miles. A loop up and around Pine Banks will add three more miles, or a run around the MRC summer route to add 6 or 7 more. Again, let me know what you’re thinking and we’ll see what we can do. For those that haven’t trained with the Sunday Long Run before, you’re likely to hear the term “Don’t do anything stupid”. Taper time is time to avoid doing anything uncalled for that might risk your race day. There will be a time you pause and think “should I be doing this?”. When this happens the answer is “No”. Your body is tuned for running right now. Wait two more weeks to become that awesome softball player, or trying to bowl that perfect game, or moving all that landscaping material around your yard, or climbing that mountain. If you wonder if its stupid, it is. don’t do it. Ok, it’s time to taper. Who’s in? Roll Call!